Local fruits taste good, unique, and healthy as well. We are invaded by imported fruits for a long time. They often have fancy labels and perceived as better fruit than the locals. However, we can now proudly counter these notions. Local fruits taste good, unique, and healthy as well. 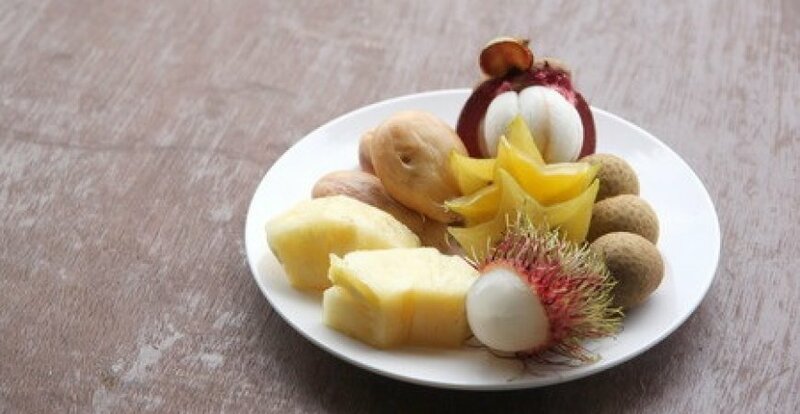 Here are some native fruits of Indonesia and even though we often eat them raw, there are also fun ways to turn them into fancy culinary products. Star fruits are native fruits of Moluccas. It is pretty strange that now these fruits are popular as the icon of Depok instead the icon their origin. Star fruits have quite high amounts of sugar and water. One of the sweetest varieties is belimbing dewa, means star fruits of God. However, the devil is in the distinctive aroma since star fruits somewhat lack of them. These kinds of fruits are actually suitable for wine ingredients. Star fruits are fragile fruits and the fragilities brought people’s creativities out. Now star fruits are processed into jam, syrup, juice, and even dodol. Star fruits can also be turned into preserved fruits and cake. Mangosteens are native fruits of Java, Sumatera, and Moluccas. The skin is thick and hard covering white, soft, and fibrous flesh. The ripe fruit is sweet and juicy. There is a legend about mangosteens. One day Queen Victoria rewards anyone who can give her fresh mangosteen. This legend came from 1930s books of David Fairchild, a fruit explorer. This legend leads to mangosteens’ nickname, Queen of Fruit. Mangosteens are eaten fresh. Since they do not grow outside tropical areas, there are dried and canned mangosteens in Western countries. Mangosteens flesh has modest amount of nutrition although the skin is believed to have high potentials to fight cancers and boost immunity. Salaks are native fruit of Java and Sumatera. They are also cultivated in Bali, Moluccas, Celebes, Timor, and Malaysia. They grow on short palm with big thorns and 2-metres-long leaves. Due to its unique scaly skin, salaks are also nicknamed snake fruit. Depending on their varieties, salaks have various tastes and textures. For examples, salak Condet is sweet and slighty acidic with large size and grainy texture while salak Pondoh is sweet and crunchy. Meanwhile, Salak Bali is famous for the white colour with moist, thick flesh and sweet flavour. They come from different regions in Indonesia and become the icon of each of their regions. Salaks are eaten fresh. However, these fruits are often processed into numerous kinds of snack such as preserved salak, pickles, canned fruit, jam, crackers, even syrups and jam. Ambarellas are fruits native to Eastern Indonesia. These tropical fruits now grow in all Southeast Asia and South Asia. Ambarellas are green in colour and taste very tart when they are immature. However, they turn yellowish green and get sweeter when they are ripe. They are popular fruits in Indonesia, especially when they come to key ingredients for rujak, an Indonesian fruit delicacy. They are often eaten raw as well. To preserve them, ambarellas are processed into pickles and candied fruits in syrups. Ambarellas can be made into jam and chutney as well. Ambarellas have high amount of vitamin C. Consuming these fruits is good for skin and also prevent our body from free radicals. Tags: indonesian fruit, star fruit, belimbing, mangosteen, manggis, salak, salacca, ambarella, kedondong.